Summary This chapter provides an overview of two streams—the automation of activities and programming paradigms—which drove and supported the evolution of electronic services. These services are service systems implemented using important elements from the fields of automation and programming. It presents several classifications to understand the nature of services according to different views. 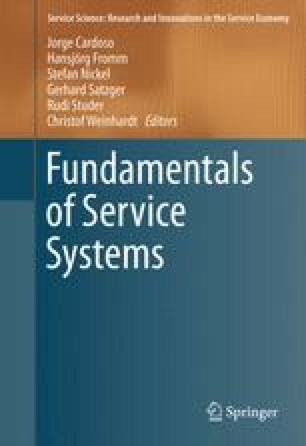 Since services can take various forms, the chapter explains and contrasts electronic services, web services, cloud services, the internet of services, and service-oriented architectures. ATM machines were one of the first electronic services to be developed in the late 60s. Identify other electronic services introduced in the 70s and 80s. Use Froehle and Roth  classification to characterize the following services: expedia.com, booking.com, 99designs.com, redbeacon.com, lulu.com, threadless.com, odesk.com, and facebook.com. Give additional examples to cover all types of the classification. Identify existing technology-free, -assisted, and -facilitated services which can constitute good candidates for their transformation into technology-mediated and -generated services. Find programming examples of applications implementing the client-server model using RPC, CORBA, DCOM, and JRMI. The client–server model is a distributed application structure that partitions tasks between the service providers (requested service) and service requesters (requesting application). Contrast the benefits and difficulties of each programming techniques. The interface of a SOAP web service is described with the specification language WSDL. Provide an example of a WSDL description of a web service with two operations: string getAddress(long custID) and setAddress(long custID, string regionID). Which benefits can cloud services provide to businesses? What type of cost savings can be achieved? How flexible and agile are cloud services? Who typically owns the data and where it is stored? Classify the following cloud services as SaaS, PaaS, or IaaS: lunacloud.com, scalextreme.com, cirrhus9.com, logicworks.net, cohesiveft.com, and appcore.com. Contrast and compare web services, cloud services, and Internet of Services. This project analyzes the cost differences of deploying an on-premise physical and software infrastructure versus adopting services from a cloud computing provider. You will use the calculator provided at tco.2ndwatch.com to compare the total cost of ownership (TCO) of both approaches and highlight key points when considering cost. The total cost of ownership accounts for the costs to run a software system over its lifetime. It is the best metric to compare the costs of cloud computing and on-premise software deployments. It includes the fees paid to vendors, maintenance and support, and hardware, equipment, and staff costs. The service tco.2ndwatch.com calculates the TCO of using Amazon Web Services versus running applications on on-premise infrastructures. Download the report generated and examine the total expenditures for both strategic approaches. Which one is more cost-effective? What are the main reasons? What characterizes the borderline which can make one of the approaches more attractive over the other? In a second step, use the service provided at planforcloud.com to determine which cloud provider would supply the most cost-effective solution for the company under study. What are the reasons? In a last step, write a concise expert report with all the findings recommending to a (possible) manager the best approach to follow (cloud computing or on-premise) and, if a cloud computing approach is recommended, which cloud provider would be best suited to contract. An electronic service, or shortly e-service, is a service that allows a remote interaction using information and communication technologies (ICT) such as the internet, software applications, and computing resources. A web service is a technology and approach of communication which enables a software system to support interoperable machine-to-machine interaction over a network. A SOAP service is an application-accessible web service that uses the SOAP protocol for exchanging structured information between the two parties involved, i.e., the service provider and the service client. A REST service is an application-accessible web service that uses REST architectural principles and web specifications as underlying paradigms and technologies, respectively. Cloud services are designed to provide easy, scalable access to applications and resources. They are managed by cloud service providers. Services are made available on-demand from a cloud computing provider’s servers in contrast to being provided from a company’s own on-premise servers. Popular cloud services include Google Docs (documents), Dropbox (files), and Flickr (photos). Cloud computing refers to the delivery of hosted services over the internet (i.e., the cloud). Services are predominantly divided into three categories: Infrastructure as a Service (IaaS), Platform as a Service (PaaS), and Software as a Service (SaaS). An architectural style and business-centric programming paradigm to develop distributed systems where systems consist of software clients, which act as service consumers, and software providers, which act as service providers. The internet of services envisions to provide an ecosystem to foster the trading of application and human services over the internet. Beyond downloading music, ordering books, storing files remotely, and booking flights, services can also be traded as commodities. Service descriptions are generally formal representations of functional and non-functional characteristics of services. SOAP web services use WSDL, and electronic services can use Linked USDL for their descriptions. Olaf Zimmermann, Mark Tomlinson, and Stefan Peuser. Perspectives on Web Services: Applying SOAP, WSDL and UDDI to Real-World Projects. Springer, 2013. Leonard Richardson, Mike Amundsen, and Sam Ruby. RESTful Web APIs. O’Reilly Media, 2013. Thomas Erl, Ricardo Puttini, and Zaigham Mahmood. Cloud Computing: Concepts, Technology & Architecture. Prentice Hall, 2013. Jorge Cardoso and Amit Sheth. Semantic Web Services, Processes and Applications. Springer, 2006.